I love that this mom DOES IT- even though it wasn't easy. Sometimes we are just so blessed. (And of course, if you would like to answer the VBAC interview questions, you can find them on the Mama Birth blog. So, I would love for you to first give a brief rundown of your first birth/s and what you feel like happened and why you had a c-section. With my first birth I went in at 39+2 because I wasn’t feeling baby move around as much. His heartbeat was strong and everything looked fine in the ultrasound except that a radiologist said he thought he saw meconium in my waters and so my doctor wanted to have me induced the next morning. We stayed at the hospital that night as they wanted to monitor the baby and the next morning the induction started…and to make a long story short…failed. I labored most of the day…mostly on the ball or in a rocking chair and occasionally on the bed. My doctor pushed me to get the epidural that evening as she thought it would help me relax and dilate. Looking back…I wasn’t having a hard time relaxing…and I wish I would have tried some different upright positions first. But I didn’t know about all the options and I wasn’t informed. After the epidural I made it to 3-4 cm and baby came down to 0 station before the heart rate started dropping and they whisked me away for a c-section. There were no position changes to see if baby’s heart rate would improve and a nurse actually started prepping me for the surgery before I had even been told I was having the surgery. I was bummed with my birth experience, especially since when they broke my water there was NO meconium, and started reading about inductions and c-sections. This is when I started to discover a lot of information on unnecessary inductions and how it is very common for inductions to fail and turn into an emergency c-section. I felt like my reason for the first c-section had nothing to do with my body’s ability to birth a baby. I also did a lot of reading on VBAC vs. c-section risks and felt that as a healthy person with a low risk pregnancy the first time around I had a good chance of a successful VBAC…if I could find a doctor who would truly support me, not just up to 40 weeks. I also learned a lot, during this time, about all of the side affects the drugs given during birth can have on the baby, along with the separation after a c-section (I didn’t see my son for 2 hours after they took him from the OR while I was getting stitched up) and the pain killers I was taking after, as our son had a very hard time with breastfeeding in the beginning. Luckily we stuck it out with next to no sleep (for me anyway!) and he turned into a champ nursling. So in the end not only did I NOT want to go through another c-section recovery, especially with a 3 year old at home, but I also hoped for that time with my baby right after birth to bond and nurse. I got lucky in that someone in a VBAC support group knew of a doctor near me who would be supportive of my birth wishes and didn’t have to talk with numerous doctors to find someone. I found the group before I had even become pregnant on CafeMom and one of the ladies in the group was from Alaska (our home state) and knew of a doctor who was a strong supporter of VBACs with a very high rate of successful VBACs, as well as a very low c-section rate overall! Their office was only about 40 minutes from our house, not too bad. So the minute I found out I was pregnant again I called them and made my first appointment. My labor was long…about 26 hours. It started out very tolerable (while laboring at home in the tub) and got more intense later on at the hospital. Unfortunately the telemetry monitor was broken so I was unable to labor far from the bed or in the tub once at the hospital as they only had one of these monitors. I still wonder if this would have made a difference! The things that helped me the most were knowledge and support. I read tons of statistics, as well as many different successful VBAC stories--home, birth center and hospital births. Obviously having a very supportive doctor was a big factor and I also hired a doula (who happened to be my doctor's wife). I also labored at home as long as possible. I did many things differently. I took even better care of myself. I worked out through all but the last month of my pregnancy and during the last month I continued to stay active and walk a lot. I was more careful to keep a healthy diet. I also read a lot of birth stories as well as books on natural labor such as Ina May’s Guide to Childbirth. We also took the childbirth class through our doctor’s office, taught by his wife (my doula). I was much more aware of how my body works during birth and the positions and things that help a baby to pass through the birth canal. Basically I knew I wanted to avoid the hospital bed as much as possible! At my last appointment before my labor started I was 42+1. My doctor talked with me about the risks most commonly associated with going post dates (this came up at 42 weeks…not 40! J) and left the decision up to me and my comfort level. I was more comfortable staying pregnant than being induced. What he did do when he checked me was strip my membranes. I was 4cm. This was at 10:30 am. I spent about 20 minutes on the monitors in the office and baby looked great! I went home and went about my day with our son. About 4 hours later, right around nap time-thank goodness-contractions started coming a little harder and a little more often. I took it easy and relaxed through the afternoon. My husband came straight home from work and we decided shortly after to have his parents come and pick up our son as soon as they got off work since things were continuing to intensify. The contractions were hard enough by the time they got here, around 5:30 pm, that I went upstairs while they were gathering everything and putting the car seat in their car because I didn’t want to be around anyone. It was around this time that my doula suggested getting in the tub as my contractions were about a minute long and 3-4 minutes apart. I got in around 6 pm and stayed there until we left for the hospital at about 9 pm. I was honestly scared to get out as the tub felt so great, especially since I knew once I got out I was done with the water as the one wireless/waterproof monitor the hospital had was broken (I knew this ahead of time because my doula had spoken to one of the nurses-a friend of hers-to let them know we would be coming in that night). The drive to the hospital was not so fun. When we got there the nurse already had my room ready so I did not have to wait. It was around 10pm and I was 7 cm. They would not check me again until I felt “pushy”. I labored for quite awhile on the ball and then standing with “extended trips to the bathroom”. Also known as time free of the monitor to move a little more although I tended to spend that time laboring on the toilet! Into the wee hours of the morning the contractions started to get much more intense. At one point I was laying on my side in the bed to rest a bit in between them and I started to give little pushes through a contraction. My doula says, “Were you just pushing?” and my response is “I don’t know…maybe?” Haha! Yes I was…unfortunately when the nurse came in to check me I was now almost 7 cm and my cervix was starting to swell. At this point my doctor (my doula’s husband!) told me that it would probably be a good idea for me to get the epidural so I could relax and get some rest…especially since I was having to fight the urge to push…and hopefully it would help the swelling go away and I would continue to dilate. At this point I had been at the hospital about 7 hours and was still at 7...actually a little less like I said. So against my original birth plan I got the epidural and we went on from there. My doula went home to tend to her children while I slept some and would return before it was time to deliver. About 2 hours later I woke up to a group of nurses rushing into my room and flipping me to my other side and giving me oxygen to try to stabilize baby’s heart rate. Luckily it worked but it wasn’t recovering the way they would like to see it recover. Shortly after my doctor came in and told me we might have to think about a c-section if things didn’t change as I still wasn’t dilating and if baby didn’t start handling contractions better he couldn’t give me a small dose of pitocin to see if it would help. Another change in my plan (the pitocin), however I knew that he does not commonly give a patient pitocin unless truly necessary. I was ok with it since I had been given much more than an hour or two to progress and still wasn’t. He sat in that room with me for probably 20 minutes and just watched that fetal monitor and right near the end baby started handling contractions excellently and continued to do so!! YAY!! It was about 9am when we started a very low dose of pitocin and it was never upped until baby had been watched at that level of dosage for at least an hour each time. I did have to stay on my right side…baby did not like it when I laid on my left. Around 2:30pm I told I nurse I was feeling some pressure and was complete. Right after that my doctor came in. He hadn’t even been planning on checking me when he came in but I had asked her to. At this point when she replaced the towels there was a little bit of meconium that had shown up. We decided to let baby labor down for awhile so we arranged my bed into a more upright position and almost everyone went to have lunch while I sipped on a cup of beef broth I imagined to be my Dad’s homemade beef barley soup. The imagining didn’t work! But it was better than nothing! Once everyone came back I was starting to feel uncomfortable as the epidural was wearing off and at 4 I started to push. THIS my little peanut did not like. The heart rate was dipping very low and not recovering quickly. I heard the doctor mention forceps if we couldn’t get baby out fast and that was when I really got down to business. I remember him turning to my doula and saying something along the lines of “We’ll wait a minute…she’s a good pusher!” She told me when we met up afterwards that I was about 1 minute away from him using the forceps to get baby out fast. I pushed her out in 15 minutes! It was a girl! I was shocked! I had convinced myself we would have another boy. My doctor routinely practices delayed cord clamping. Unfortunately she came out limp, followed by a huge gush of meconium stained water, and had to be quickly moved to the pediatrician to have her stomach pumped out. Thankfully her lungs were crystal clear but they pumped about an ounce of meconium out of her stomach. It was only maybe 10 minutes before I had her skin to skin. Still much better than the 2 hours I waited for my son! They did not weigh, measure or bathe her until I had had her for a good two hours. She was 21.5” and 9 lbs 1.1 oz. While there were some scary points and we came close to a c-section, I did it! And I am so grateful to my doctor for believing in the process and being patient and giving us a chance. There was more than one moment in my labor where my previous doctor would have whisked me off to a c-section. 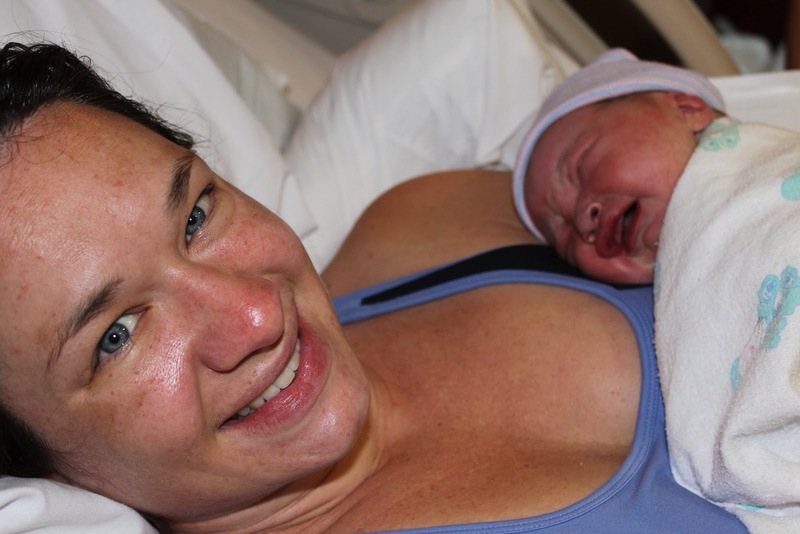 While it wasn’t exactly the natural labor and birth I had planned…it was still the VBAC I had planned and I don’t regret any of it. My postpartum experience has been so completely different…despite the 3rd degree tear I received pushing out my big baby in 15 minutes. Even recovering from this and a bruised tailbone I was amazed at how much sooner I felt up to doing things like going to the store, doing laundry, etc. I have so much more energy that I did after my c-section. It truly amazed me how fast my body started to bounce back. Thank goodness since we also have a son who is almost 3! We also have had an easy time getting nursing underway whereas with my son it was very difficult for the first couple weeks. Not to mention it was such a relief to not be spending 3-4 days in the hospital after the birth. I hope more doctors will start allowing healthy women to VBAC as it is very possible and so much better for mama and baby.